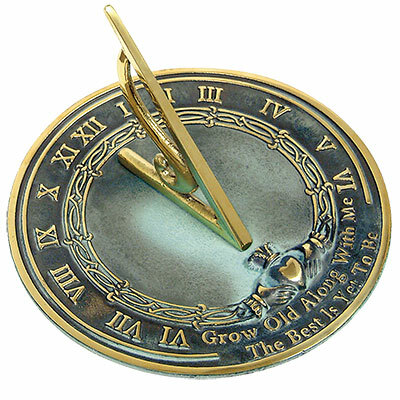 Add a hint of Ireland to your garden with the Rome Brass Grow Old With Me Sundial. This dial features a Celtic band near the center, with a traditional raised claddagh at the base. Roman numerals rest outside the band, and the phrase "Grow old along with me/The best is yet to be" completes the look. The raised sections have a polished brass finish, to contrast the verdigris background. Connect the polished brass gnomon to the dial, and place it facing celestial north. The shadow cast from the gnomon will fall on or between the numerals, to indicate the time. Use the included hardware to mount this item on a pedestal, or place it on a flat surface for a hidden treasure. The solid brass construction will withstand exposure to the elements, and the verdigris and polished brass finish will age beautifully. Create an exotic retreat in your garden with the Brass Grow Old With Me Sundial. Rome Brass Happiness Sundial, Verdigris, 9.875" dia. Rome Brass Kiss of the Sun Sundial, Verdigris, 9.875" dia. Rome Brass Gothic Sundial, Verdigris, 8.5" dia. Rome Brass Father Time Sundial, Verdigris, 11.125" dia. Rome Cast Iron Father Time Sundial, Verdigris, 11.125" dia.